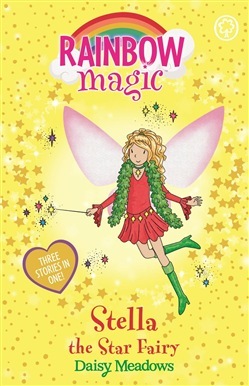 Stella the Star Fairy is all in a flutter, trying to put the sparkle into Christmas. Stella looks after all the special Christmas lights - from the overhead illuminations,to the Christmas tree fairy lights, right through to the twinkling stars. Three magic Christmas baubles control all of these elements but now Jack Frost's goblins have stolen them. There's not going to be any Christmas atmosphere and Santa won't even be able to guide his sleigh through the night sky. Stella the Star Fairy needs Rachel and Kirsty's help to get the baubles back.Stella the Star Fairy is all in a flutter, trying to put the sparkle into Christmas. Stella looks after all the special Christmas lights - from the overhead illuminations,to the Christmas tree fairy lights, right through to the twinkling stars. Three magic Christmas baubles control all of these elements but now Jack Frost's goblins have stolen them. There's not going to be any Christmas atmosphere and Santa won't even be able to guide his sleigh through the night sky. Stella the Star Fairy needs Rachel and Kirsty's help to get the baubles back. Acquista Stella The Star Fairy in Epub: dopo aver letto l’ebook Stella The Star Fairy di Daisy Meadows ti invitiamo a lasciarci una Recensione qui sotto: sarà utile agli utenti che non abbiano ancora letto questo libro e che vogliano avere delle opinioni altrui. L’opinione su di un libro è molto soggettiva e per questo leggere eventuali recensioni negative non ci dovrà frenare dall’acquisto, anzi dovrà spingerci ad acquistare il libro in fretta per poter dire la nostra ed eventualmente smentire quanto commentato da altri, contribuendo ad arricchire più possibile i commenti e dare sempre più spunti di confronto al pubblico online.